Age in the NBA: Do older teams “find ways to win games”? Tune in to any NBA team’s local broadcast, and you will be sure to hear a litany of clichés from the commentators. Most are quick to praise older players, noting on occasion that “veteran teams just know how to win games.” The San Antonio Spurs, for example, are lauded for their ability to defy expectations, winning another NBA title last year despite Tim Duncan and Manu Ginobili closing in on 40 and Tony Parker getting well into his 30’s. Like most musings from broadcasters, these assertions are driven by little more than perception—completely unfounded points made to maintain conversation in a long season. But could there be some merit to these thoughts? There is no doubt that NBA teams are looking for any edge they can get, and do veteran players give them an advantage? Do older teams in the NBA truly “find ways to win games” like so many claim? That’s what we aimed to find out in this research. Using this formula, we built a database with each team season for the last 20 years (excluding lockout years, which had odd statistical trends) with their Pythagorean expectation of wins. Using that figure, we compared the actual wins for every team to their expectation, and generated a residual figure for each individual team season. A positive residual means that a team won more games than their point differential would forecast, and a negative residual means the opposite. The other major metric used in this section of the research is minutes-weighted age. Averaging all the ages of players on the roster does not give an accurate representation of a team’s effective age as it fails to distinguish the impact of a player like Tim Duncan, who played over 2000 minutes for the Spurs in 2013-14 at the age of 37, versus Steve Nash, who played all of 313 minutes in that same season. However, by weighting the average by the amount of minutes a player has played, we get a much stronger metric for the effective age of an NBA team. We then normalized the weighted age values to zero using the league average for each season to account for changing ages in any given year. 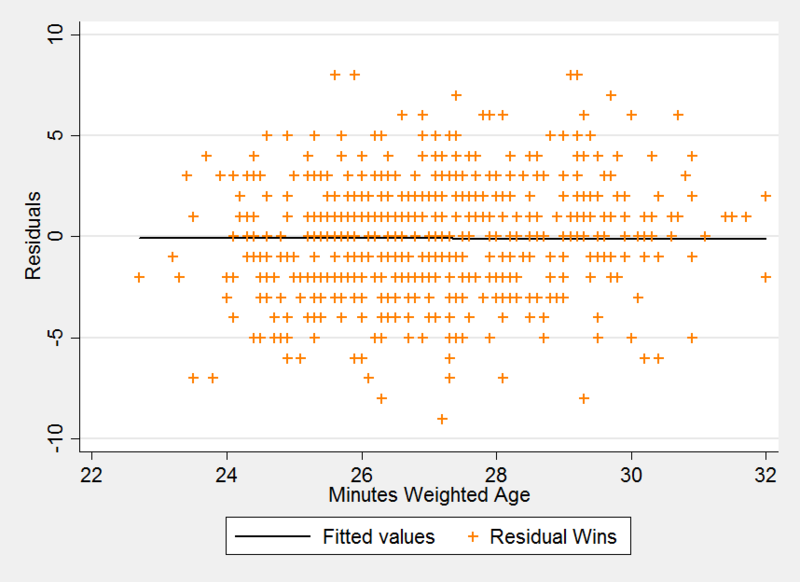 With the regression model above, we found that there was no significant relationship between a team’s minutes weighted age and their residual wins. Because the residual wins value was centered on 0, there is no intercept term, and the only thing that remains in the regression is the slope value times the explanatory variable, age. That slope value was essentially zero, with no statistical significance whatsoever. As you can see, the data yielded no statistically significant results with respect to a relationship between older teams outperforming or underperforming their expected wins. In fact, looking at publicly available data for the last 20 years, there were no apparent trends for teams outperforming their expected wins. Faster paced teams, teams that shot a lot of threes, won a lot of games, or got to the free throw line a lot all did not see a statistically significant improvement in outpacing their Pythagorean expectation. Perhaps this is not a groundbreaking result, but it highlights the effectiveness of Pythagorean expectation that not only is it an unbiased estimator of a team’s winning percentage regardless of age, it is unbiased regardless of virtually any factor you can check. Teams that scored a lot, very little, or in the middle all tended to match their Pythagorean expectation on average. This unbiased nature of the Pythagorean estimator has its roots in the derivation of it. Research has shown point differential to be a better indicator of a team’s performance than winning percentage, and this further investigation supports that research. This is just one way of evaluating whether veteran teams get an edge, but at least in this sector of our research, it is clear that older teams do not have any advantage. Older teams might play slower, shoot more threes, or dunk less, but they will match their Pythagorean expectation over time.